A mod that allows you to wear your normal clothing in a PVP zone. This mod is not cosmetic. Other players will see you in normal clothing also. Be the coolest kid in Fusang! Bonus: Also has an autojoin option. Open up your PVP map and you will notice a new tab on the minimap called "Config". Click on that and you will see two checkboxes. "Auto-Join" will allow you to automatically enter the PVP zone without a prompt (don't use when grouped). 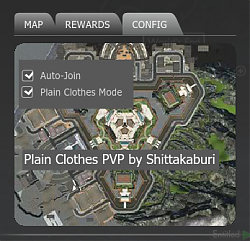 "Plain Clothes Mode" will allow the main feature, normal clothing, in PVP. This must be selected before entering PVP, of course. Unzip and put all *.swf into the Customized\Flash\ folder. If you are currently running the game, run "/reloadui" to enable. You will not get a PVP buff if you use this mod. This is not by design, but necessity. You can't talk about exploits on the forums. You can't ask if something is an exploit. It is expressly forbidden in the forum rules. That they deleted your post is not a comment on this mod. If you are really so concerned, don't use it. Last edited by shi_ttakaburi : 01-22-2013 at 10:21 PM. I think it is unlikely Funcom cares too much. 1. Using plain clothes in PVP has a built in disadvantage with the loss of the PVP buff, so few will use it often. 2. The mod has been around since September and there have been no reports of bannings or warnings. 3. Funcom has, heretofore, been reasonable with behavior it doesn't like, issuing warnings and 24-hour bans so, I think, even if Funcom changes its mind about this mod, no one is any real danger of more than a slap on the wrist. Of course, if anyone experiences a problem, they can contact me. Are you sure that Funcom has nothing against this mod? I would not recommend to use it for people, that don't like to risk there accounts become banned.